I like classic stories about, well lots of things, including UFOs. There is no way of being sure as to how much of the stories are true and how much, like Chinese Whispers, have been slightly altered over the years. The one I'm about to write about dates back to 1663. Yes, UFOs have been recorded for hundreds and hundreds of years. "Most venerable lords, humble greetings from your servant Ivachko Rjesvkoi. The peasant Levka Fedorov, domiciled in the village of Mys, submitted to me the following first-hand account. On this, the fifteenth day of August in the year 1663, a Saturday, the faithful from the district of Belozero had gone to church in Robozero and whilst they were there a great crash sounded out of the heavens and many people left the Church of God to assemble outside on the square. Around the stroke of midday there descended upon Robozero a great ball of fire from the clearest of skies, not from a cloud; moreover it came from the direction from which we get winter and moved across the church to the lake. The fire was about forty-five metres on each side, and for the same distance in front of the fire there were two fiery beams. Suddenly it was no longer there but about one hour of the clock later it appeared again, above the lake from which it had disappeared before. It went from the south to the west and was about 500 metres away when it vanished. But once again it returned, filling all who saw it with a great dread, travelling westwards and staying over Robizero one hour and a half. Now there were fishermen in their boat on the lake about a mile away and they were sorely burnt by the fire. The lake water was lit up to its greatest depths of nine metres and the fish fled to the banks. 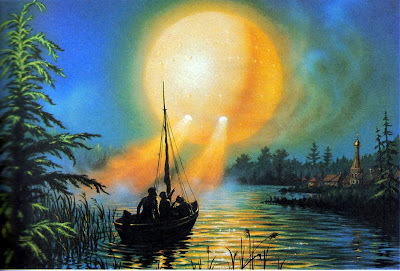 The water seemed to be covered with rust under the glow." At the time the authorities believed this was a genuine sighting as over 500 people witnessed the 'fireball'. Some locals believed they had been visited by God and Robozero became something of a shrine and place to visit. No conclusions as to what the residents saw have been reached: maybe a comet or meteor? But present day Ufologists would like to think of it as a UFO. At the time the people would never have imagined such a thing as being some sort of vehicle. It would have been beyond their comprehension. The only thing pretty much for certain is that the people of Robozero defintely saw something very unusual. The classic stories are always fascinating. I'd never heard this one, Mike. Thanks for posting!